Iowa City, Iowa:: Naughty Dog Press,, 2019.. Edition of 50. 5 x 3.5"; 8 leaves plus end pages. Printed from polymer plates made from rubber-stamped texts on a Vandercook SP15. Pamphlet bound in duplexed Bugra paper. Signed and numbered by the artist. Emily Martin: "This paper was given to me by Andrew Honey, conservator at the Bodleian Libraries, during my residency at the Bodleian Bibliographical Press in the fall of 2018. The full water mark says India, Oxford with a crest of the University of Oxford, and made in Great Britain. Andrew has very little information on this very thin and very opaque paper other than it was intended for the printing of bibles. I have wondered if it was intended for bibles to be taken to India by missionaries. At about the same time that I was given the paper, on the North Sentinel Island, [one of the Andaman Islands in he Bay of Bengal] administered by India, a Christian missionary was killed by members of the Sentinelese tribe despite strict prohibitions on outside contact. The Sentinelese are the only uncontacted tribe on earth inhabiting their own island. They are extremely vulnerable to diseases and social breakdown in the event of contact with outsiders. They have repeatedly made clear their desire to be left alone. The end sheets were also given by Andrew Honey." 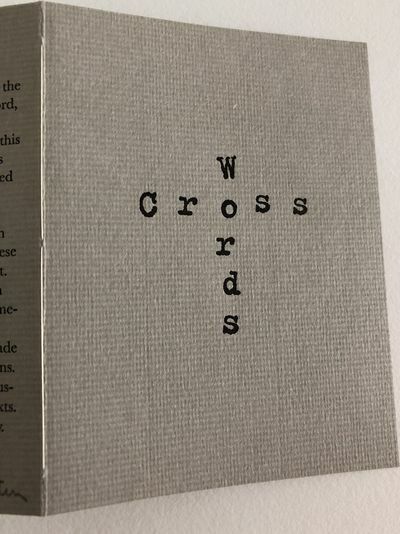 The artist's "cross words,' actually two or more words that cross at their shared letter(s) to look like a Christian cross, combine the intense xenophobia of the Sentinelese and the zeal of Christian missionaries.